Receive special offers via email Sign Up! Win a Free Vacation — Enter Sweepstakes! Hosted Sailings offer Outstanding Value and Exclusive Amenities. In Partnership with multi-Tony Award-winning Broadway producer Kevin McCollum, Crystal is pleased to invite select cast members or creative talents from some of Broadway’s premier shows. Onboard, Crystal guests will enjoy dedicated performances and informative lectures from these theatre experts. Cruise line theme is subject to change or cancellation without notice. Special promotions available on this sailing! Promotions may include Book Now Fares, Optional Air Program and More. Ask about Low Air-Inclusive prices! *Restrictions apply. Promotions vary by sailing and not all of the above mentioned promotions apply on every sailing. Savings are reflected in the fares in the Pricing and Staterooms tab. Offers are subject to availability, capacity controlled and may be withdrawn at any time. READY TO PLAN YOUR SHORE EXCURSIONS? To view our top picks, please click here. Vancouver is a thriving metropolis surrounded by natural beauty. With parks, beaches, gardens, museums, art galleries and the second-largest Chinatown in North America, Vancouver lives up to its promise of offering something for everyone. With modern buildings set against green, rolling hillsides, this city is breathtaking; no location offers a more spectacular view than Stanley Park - with a zoo, aquarium, totem poles and honking geese. A short walk from the park leads to Robson Street, which offers the town's best window-shopping. Stores with European flavor share the avenue with delicatessens and tea rooms ready to serve. As architectural heart of the city, Robson Square features a central plaza with a food fair and an old provincial courthouse, which now houses Vancouver Art Gallery. Be sure to stop at 8 Pender St. - "the narrowest building in the world." Other points of interest include the Museum of Anthropology; Japanese-style Nitobe Memorial Garden; and VanDusen Botanical Garden. Capilano Canyon is site of the world's longest and highest suspension footbridge. Imagine being confronted with a myriad of mysterious channels. Following each fjord to the interior, encounter massive mountain ranges, towering cliffs, tumbling waterfalls, virginal forests of two-hundred foot tall spruce, while whales, bears, seals, salmon, eagles and other wildlife. Always they were stopped by an inevitable face of ice - glaciers pushing inexorably downward to meet the sea. What must have been a mapmaker's nightmare is today cherished as the continent's last great untouched wilderness, harbouring the world's largest temperate rain forest. An Eden of the North to captivate the every modern-day explorer. 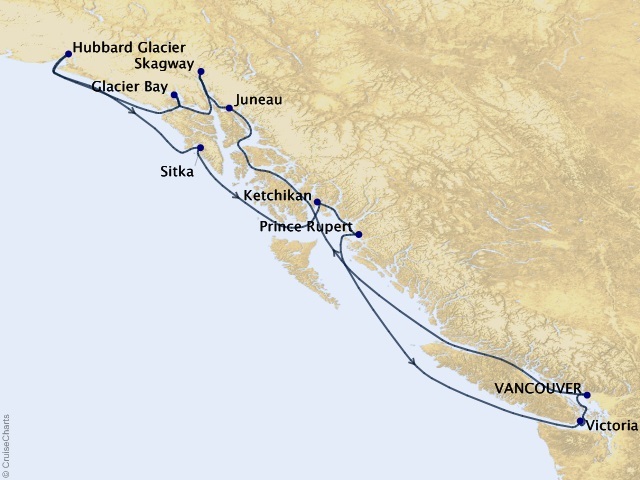 The string of islands of the Inside Passage create a protective barrier to the open sea running from the Washington State/Canadian border and the bottom of Vancouver Island all the way up to the top of Chichagof Island, where the Gulf of Alaska begins its curve westward, offering a supremely serene cruising environment in some of the most dramatic surroundings on earth. Juneau is one of America's most beautiful state capitals, with the looming summits of Mt. Juneau and Mt. Roberts providing a gorgeous backdrop. Once part of Alaska's Gold Rush, the city boasts natural and manmade attractions. Downtown is filled with many vibrant buildings, including must-see St. Nicholas Russian Orthodox Church, which houses artwork and artifacts dating back to the 18th century. From the bright mural in Marine Park to the carvings in House of Wickersham, downtown is filled with Alaska's own unique brand of culture and architecture. Often hailed as Juneau's most impressive sight, nearby Mendenhall Glacier is approximately 12 miles long and 1.5 miles wide. See the glacier on a float trip or a "flightseeing" adventure, or hike up one of its trails for a closer inspection. For a bird's-eye view, the Mt. Roberts Tramway offers a short, six-minute trek to the top of Mt. Roberts, 1800 feet above the city. If wildlife is your passion, scenic Admiralty Island has the world's highest concentration of brown bears. This "Gateway to the Klondike" watched as fortune-seekers headed to Chilkoot and White Pass Trails during Alaska's Gold Rush. Today, feel like a prospector in Skagway, as you walk along its rustic boardwalks and frontier-style storefronts. This cozy town offers a pleasant respite from the hustle and bustle of most cities. With classic cars and one of the oldest narrow-gauge railroads in the world, the city retains the flavor of days gone by and remains an important link to Alaska's history. A stroll down Broadway is a must. Highlights include Arctic Brotherhood Hall. Other buildings like the Trail of '98 Museum, Corrington's Museum of Alaskan History and the Alaskan Wildlife Adventure and Museum present different facets of prospecting times. Before hitting famous Chilkoot Trail, there are other well-marked trails to try. Hiking to Lower Dewey Lake is an easy, 20-minutes, and there are more adventurous trails to remote Sturgill's Landing, Upper Dewey Lake and Devil's Punchbowl. The White Pass Scenic Railway and Eagle Preserve Wildlife Quest provide additional options. Spread across an impressive 3.2 million acres in southeast Alaska, Glacier Bay National Park and Preserve offers an inspirational glimpse of what Mother Nature does best. The head of Glacier Bay is Tarr Inlet, where scientists have found exposed rock believed to be more than 200 million years old. The Tarr Inlet is home to Grand Pacific Glacier, an active body of ice slowly making way toward Margerie Glacier, which it last touched in 1912. Johns Hopkins Inlet is home to no less than nine glaciers. Framed by rocky slopes stretching skyward more than 6,000 feet, these wondrous bodies are eclipsed only by mighty Mount Fairweather, which at more than 15,300 feet is the highest point in southeast Alaska. In northeast Glacier Bay, the snow-covered Takhinsha Mountains feed active Muir Glacier. The brilliant blue glow of a calving glacier and the thunderous roar of ice crashing into the water below are sights and sounds to remember for the rest of your life. With such diverse landscape, the park provides a variety of habitats for animals. Seventy-five miles long and covering over 1,350 square miles in area, the Hubbard Glacier is the largest tidewater glacier in North America. It is also one of the most impressive, a 300-foot wall of ice rising sheer and jagged from the ocean. You may hear the rumble and see the monumental splash as the glacier breaks off in great ice chunks, known as "calves." Resting between snowcapped mountains and the Pacific Ocean, Sitka is one of the most beautiful seaside towns in Alaska and the biggest city in America - encircling 4,710 square miles on Baranof Island. No symbol shows Russian influence more than the landmark St. Michael's Cathedral. Original artifacts and icons, including the Sitka Madonna, were saved from fire and are on display. Visit Castle Hill, once site of a two-story log mansion known as Baranof's Castle, which overlooked Sitka Sound during the town's fur trading days. Only stone walls and mounted cannons remain from Russia's bloody battles against native Tlingit. Sitka National Historical Park offers information and artifacts relating to the Tlingits, including totem poles as a chronicle of early life on this fertile ground. Alaska Raptor Rehabilitation Center cares for as many as a dozen bald eagles and other birds at a time. The facility caters to rare wildlife recovering from injuries incurred in the wild. Among the more popular trails is Indian River Trail, which parallels a salmon stream, and the three-mile-long Gaven Hill Trail. Ketchikan is known as "Alaska's First City" because it's the first major community travelers come to as they travel north. The city is built on steep hillsides and is billed as salmon capital of the world. A quaint village, the town is three miles long and three blocks wide. With fishing boats sailing in and float planes ascending from the water, this seaside town is bustling with activity. With the world's largest collection of totem poles, Totem Bight State Historical Park offers insight into various native cultures of the Pacific Northwest. These wood-carved creations tell colorful, intricate tales – often showing a family history or depicting a local legend. Ketchikan has many options for adventure of relaxation, including mountain bike tours, sea kayaking, seaplane riding, or strolling down the boardwalk of Creek Street, Ketchikan's most famous section with a historic cable car and quaint boutiques. Blessed with an abundance of hiking trails, Ketchikan offers many breathtaking vistas, including the panoramic, 360-degree view from the top of Deer Mountain. Prince Rupert is the Gateway City for Southeast Alaska and fishing center of the Northwest. Cow Bay is a must - with a fish processing plant, public water floats, and Cow Bay Gift Galley's pottery studio and sushi bar. Enjoy Civic Centre and Performing Arts Centre. Visit Museum of Northern British Columbia, Archaeology Harbor, and North Pacific Historic Village. Kwinitsa Railway Museum exhibits railway history of the area in a Grand Trunk Railway station. Old Field Creek Hatchery tours are offered. Firehall Museum's central exhibit is a 1925 REO Speedwagon Fire Engine. A walking tour has been laid to cover the city's historic and scenic points. The Pacific Northwest is home of Tsimpsean and Haida Indians, and scattered throughout Prince Rupert are authentic reproductions of historic and famous poles. An 18-hole golf course is located at Mt. Oldfield. British culture and island informality collide in Victoria. This sophisticated seaside city is full of historic sites, parks and gardens. Take a walking tour - many of which begin at Parliament Buildings at Victoria's Inner Harbor. Combined with majestic Empress Hotel, these monumental buildings give the city a regal European feel. See equally impressive modern structures, such as Royal British Columbia History Museum, or replicas of large, native Northwest Indian houses at Thunderbird Park. Unique attractions include Undersea Gardens, Miniature World, Maritime Museum, Chinatown and Royal London Wax Museum. A memorable places to visit is world-famous Butchart Gardens, with 5,000 fauna varieties. The dazzling gardens on Saanich Inlet are beautiful at night, when hundreds of lights sparkle along winding paths. Additional gardens in Victoria include Crystal Garden and the gardens surrounding Government House and near Craigdarroch Castle, a towering Victorian mansion complete with a tower and turrets. Tour this city in a horse-drawn carriage. Itinerary subject to change without notice. Please confirm itinerary at time of booking. Cruise port, security and handling fees of $495, transfers, airfare, government fees and taxes are additional for all guests. Ocean Views™ interactive polling devices in guest lecturer discussion panels. Optional air add-ons are available from Crystal Cruises' designated gateway cities in the U.S. and Canada, and include all government fees and taxes. All prices per person and in USD unless otherwise stated. Reference this number when contacting our agency so we may better serve you. Also keeping this number handy will allow you to locate this document again quickly. The Luxury Cruise Experts (DBA) Travelland, Inc.
© Copyright 2017. All Rights Reserved. The Luxury Cruise Experts (DBA) Travelland, Inc..